Howdy! 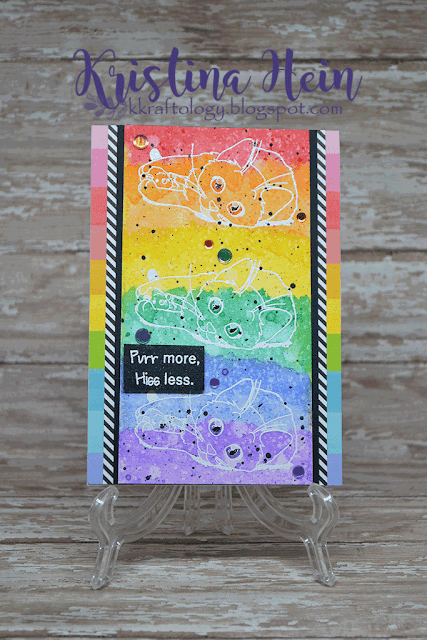 I'm back with a second card to share for the Love Your Pet blog hop hosted by JessicaLynnOriginal stamps! My first card I shared a few days ago was colored with realistic cat colors. Today I am going way outside the box! I wanted something fun, bright and cheerful. I think this really fits the bill! I did have to do a bit of measuring and planning to make sure I had the cat image from Celine's Kittens evenly spread out across the paper. I started by cutting a piece of Canson watercolor paper into a 3" x 6" strip. I used a pencil to section it off into 2x3" sections. I then wiped over the whole piece with an embossing buddy. Next I inked up the kitty with Versamark ink and stamped the image three times. After that, I sprinkled white embossing powder until I had all of the ink covered. I then used my heat embossing gun to melt the powder. Once it cooled down I went back and erased all of my pencil lines. They would be visible through the distress inks I planned on using so I needed to remove them. So, nothing seems more cheerful to me than a rainbow! I pulled out six different distress inks that I thought would make a pretty rainbow. Candied Apple, Carved Pumpkin, Mustard Seed, Lucky Clover, Blueprint Sketch and Wilted Violet. I went over the watercolor paper with a light wash of clean water to start with then started added in swatches of color. I dried it with my heat gun and went back to add another swatch of color but concentrated it at the top of each color band for a little more depth. Dried again with the heat gun. I masked off each section loosely with scrap paper and splattered the same color ink onto the same color section. Candied Apple onto Candied Apple and so on. And dried again. I then went back and added black splatters over the entire piece. Dried it one more time! At this point I set it down and gave it a hard look. I liked the overall affect but I felt the eyes looked weird with just the white. So I used a black sharpie to color in the pupil. I also darkened up the iris with each individual color to make them more prominent. I trimmed the watercolor paper down just a bit because I didn't want my finished card to be longer than 6". I cut a narrow black panel and glued the watercolor piece on top. I then cut two narrow strips of thin, black striped paper from MFT Stamps and attached it to each side. 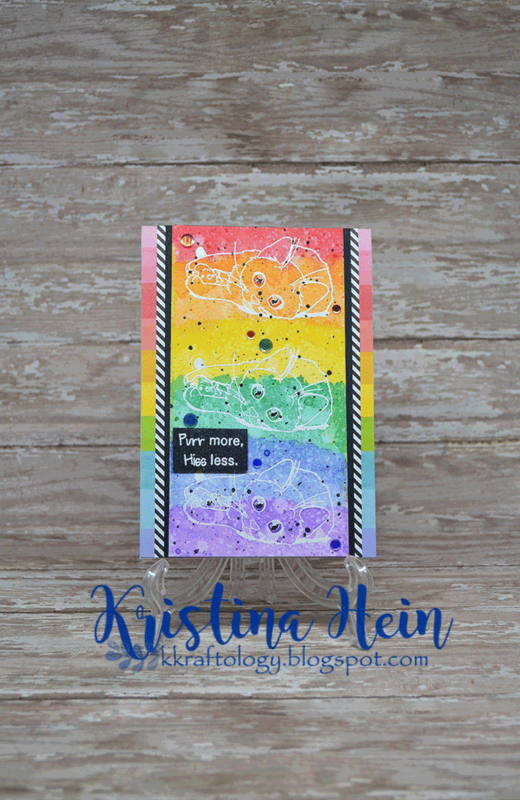 I had previously searched through my rainbow colored papers and found the perfect piece of paper from Lawn Fawn's Really Rainbow paper pack It's so pretty! I also cut thin strips of this because I didn't want to waste any of the gorgeous paper that wouldn't be seen anyways! Now the completed panel I was left with was 6" tall by 4 1/4" wide. I wanted to use Neenah 110lb cardstock for the base but of course it wasn't quite large enough, so I cut one panel 6 1/2" tall and one panel 6" tall. I scored the longer piece at the 1/2" inch mark, folded it over and glued the other panel to it on the inside. So it was butted up against the fold on the inside. Giving me the proper size card base! I glued my fun panel to the card base and called it almost done. I found I had just enough room to add the Purr more sentiment from Celine's Kittens. I stamped it with Versamark ink onto a scrap piece of black cardstock. Sprinkled white embossing powder and melted it with the heat gun. Once it was dry, I added Wink of Stella over the top for shimmer! I cut it down to the right size, added foam tape and attached it to the card. I stepped back for one final look. It needed just a little something more. Rainbow sequins! I believe these are actually the Studio Katio Crystal Rainbow Confetti sequins. I love them and they were just the perfect thing for the card. And whamo. Done! 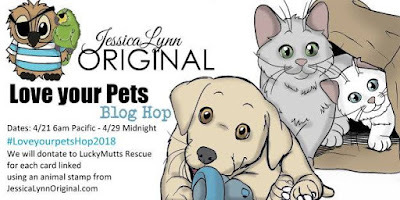 Don't forget to play along with the Love Your Pet blog hop which you can find right HERE. This hop goes through April 29th!! You still have plenty of time to link up! Remember, there are prizes to be won AND they are making a donation for every card linked up!! One final look at my finished card. This is so beautiful! Love the beautiful colors and love the strips of black and white... awesome contrast... fantastic card!